Homo Sovieticus (Dog Latin for "Soviet Man") is a sarcastic and critical reference to an average conformist person in the Soviet Union also observed in other countries of the Eastern Bloc. The term was popularized by Soviet writer and sociologist Aleksandr Zinovyev, who wrote the book titled Homo Sovieticus. Michel Heller asserted that the term was coined in the introduction of a 1974 monograph "Sovetskye lyudi" ("Soviet People") to describe the next level of evolution of humanity thanks to the success of Marxist social experiment. In a book published in 1981, but available in samizdat in the 1970s, Zinovyev also coined an abbreviation homosos (гомосос). Indifference to the results of his labour (as expressed in the saying "They pretend they are paying us, and we pretend we are working"). Lack of initiative and avoidance of taking any individual responsibility for anything. Jerzy Turowicz wrote: "it's a person enslaved, incapacitated, deprived of initiative, unable to think critically; he expects – and demands – everything to be provided by the state, he cannot and doesn't want to take his fate in his own hands". Indifference to common property and to petty theft from the workplace, either for personal use or for profit. A line from a popular song, "Everything belongs to the kolkhoz, everything belongs to me" ("всё теперь колхозное, всё теперь моё" / vsyo teperь kolkhoznoe, vsyo teperь moyo), meaning that people on collective farms treasured all common property as their own, was sometimes used ironically to refer to instances of petty theft. Chauvinism. 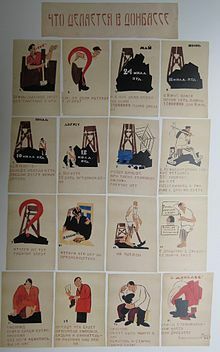 The Soviet Union's restrictions on travel abroad and strict censorship of information in the media (as well as the abundance of propaganda) aimed to insulate the Soviet people from Western influence. There existed non-public "ban lists" of Western entertainers and bands, which, in addition to the usual criteria of not conforming to fundamental Soviet values, were added to the list for rather peculiar reasons; one such example being the Irish band U2, the name of which resembled that of Lockheed U-2, a high-altitude U.S. reconnaissance airplane. As a result, "exotic" Western popular culture became more interesting precisely because it was forbidden. Due to limited exposure, entertainers considered minor, B-list, or of low artistic value in the West were regarded as A-list in the Soviet sphere. Soviet officials called this fascination "Western idolatry" / "Idolatry before the West" (идолопоклонничество перед Западом / idolopoklonnichestvo pered Zapadom). Obedience to or passive acceptance of everything that government imposes (see authoritarianism). In the opinion of a former US ambassador to Kazakhstan, a tendency to drink heavily: "[a Kazakh defence minister] appears to enjoy loosening up in the tried and true Homo Sovieticus style – i.e., drinking oneself into a stupor". According to Leszek Kolakowski, the Short course history of the CPSU(b) played a crucial role in forming the key social and mental features of the Homo Sovieticus as a "textbook of false memory and double thinking". Over the years, Soviet people were forced to continuously repeat and accept constantly changing editions of the Short course, each containing a slightly different version of the past events. This inevitably led to forming "a new Soviet man: ideological schizophrenic, honest liar, person always ready for constant and voluntary mental self-mutilations". The "Soviet man" is characterised by his tendency to follow the authority of the state in its assessment of reality, to adopt an attitude of mistrust and anxiety towards anything foreign and unknown, and is convinced of his own powerlessness and inability to affect the surrounding reality; from here, it is only a step towards lacking any sense of responsibility for that reality. His suppressed aggression, birthed by his chronic dissatisfaction with life, his intense sense of injustice and his inability to achieve self-realisation, and his great envy, all erupt into a fascination with force and violence, as well as a tendency towards "negative identification" – in opposition to "the enemy" or "the foreigner". Such a personality suits a quasi-tribal approach to standards of morality and law (the things "our people" have a right to do are condemned in the "foreigner"). Since 1991 interest has extended to the phenomenon of homo post-sovieticus. ^ "Soviet-era satirist Zinovyev dies". BBC News. 2006-05-10. ^ Heller (Geller), Mikhail (1988). Cogs in the Wheel: The Formation of Soviet Man. Alfred A. Knopf. pp. 27, 43, 47. ISBN 978-0394569260. Heller quotes from a 1974 book "Sovetskye lyudi" ("Soviet People"): Soviet Union is the fatherland of a new, more advanced type of Homo sapiens - Homo sovieticus. ^ Harboe Knudsen, Ida (2013). New Lithuania in Old Hands: Effects and Outcomes of EUropeanization in Rural Lithuania. p. 20. Retrieved 6 May 2014. ^ Turowicz, Jerzy (1993). "Pamięć i rodowód". Tygodnik Powszechny (45). ^ 1917–1987: Unsuccessful and Tragic Attempt to Create a "New Man" Archived 2011-07-27 at the Wayback Machine. ^ Greg McArthur "Vain, shady and stupendously fat: Latest WikiLeaks like a teen's diary", The Globe and Mail, 30 November 2010. ^ Kolakowski, Leszek (2008). Main Currents of Marxism: The Founders, the Golden Age, the Breakdown. W. W. Norton & Company. ISBN 978-0393329438. ^ For example: van der Zweerde, Evert (2013) . "Glasnost and perestroika". In Leonard, Thomas M. (ed.). Encyclopedia of the Developing World. 1. New York: Routledge. p. 70. ISBN 9781135205157. Retrieved 2018-07-31. Soviet-style communism was a twentieth century social experiment that failed [...]. This experiment included the attempt to create a New Man, the Homo sovieticus (Kharkhordin 1999). One of the burning questions for post-Soviet Russia still is whether Homo post-sovieticus is capable of forming the human material for a new, prosperous, and democratic Russia. Edward J. O'Boyle (January 1993). "Work Habits and Customer Service in Post-Communist Poland". International Journal of Social Economics. 20 (1). Józef Tischner (2005). Etyka solidarności oraz Homo sovieticus (in Polish). Kraków: Znak. p. 295. ISBN 83-240-0588-9. Ragozin, Leonid (9 May 2005). "Thorny legacy of 'Soviet Man'". BBCRussian.com. This page was last edited on 20 April 2019, at 01:54 (UTC).